A new survey by Pew Research survey reports that 71% of Americans believe there should be a path for illegal aliens in the United States to remain in this country if they meet certain requirements; just 27% say they should not be allowed to stay legally. A new poll by Bloomberg reports that 64% of Americans support President Obama's decision to end the deportations of some illegal immigrants brought to the U.S. as children; 30% do not support the decision. Arizona, a reliable red state in presidential elections, holds some good news for President Obama: a new Rocky Mountain Poll in the state finds President Obama ahead of Mitt Romney, 42% to 40% with 18% undecided. An earlier survey, by Merrill/Morrisson Institute reported a two-point lead for Romney, a surprisingly close race (fueled, in part, by Hispanic voters unhappy with the GOP agenda on immigration issues) for a GOP candidate. A just released Quinnipiac University poll reports that American voters--by a 48% to 35% margin--would like to see their state pass an immigration law similar to Arizona's: "The strong plurality who says they would like a similar law in their own state probably portends the law will be an issue in many, many campaigns this November across the country. Depending on how those elections and court challenges come out, copy cat Arizona laws could be a hot issue in state capitals after November." According to Gallup, "more than three-quarters of Americans have heard about the state of Arizona's new immigration law, and of these, 51% say they favor it and 39% oppose it . . . The law makes it a state crime for illegal immigrants to be in the country, and allows Arizona law enforcement officials to detain those suspected of being in the country illegally unless they can prove otherwise. The law has sparked protests in Arizona and other parts of the U.S., and calls for economic boycotts of the state." Is the US Growing More Anti-Immigrant? According to a recently released Gallup poll, the nation appears to be less welcoming to immigrants: "With some U.S. lawmakers and immigration rights activists stepping up calls for the Obama administration to pursue immigration reform, Gallup finds Americans less favorable toward immigration than they were a year ago. 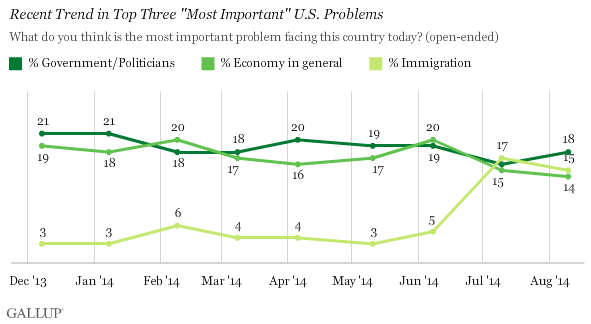 Half (50%) say immigration should be decreased, up from 39% last year. A third (32%) say immigration levels should be kept the same, down from 39%, and 14% say they should be increased, down from 18%." In an anylisis of these results, Gallupwrites: These numbers "mark a return to the attitudes that prevailed in the first few years after 9/11; attitudes softened from 2006 to last year. The shift toward a tougher stance this time around may reflect the country's economic situation, as Americans tend to become less pro-immigration during difficult economic times."